Having trouble using a form? These posts will help you out. While the Administration Building is closed, the Graduate School does not have a way to accept paper forms. Students must submit forms online to Canvas. At this time, forms are not being accepted via email. This link will go directly to the “Modules” page in the Graduate Candidates Canvas course. Log in using your Michigan Tech credentials. 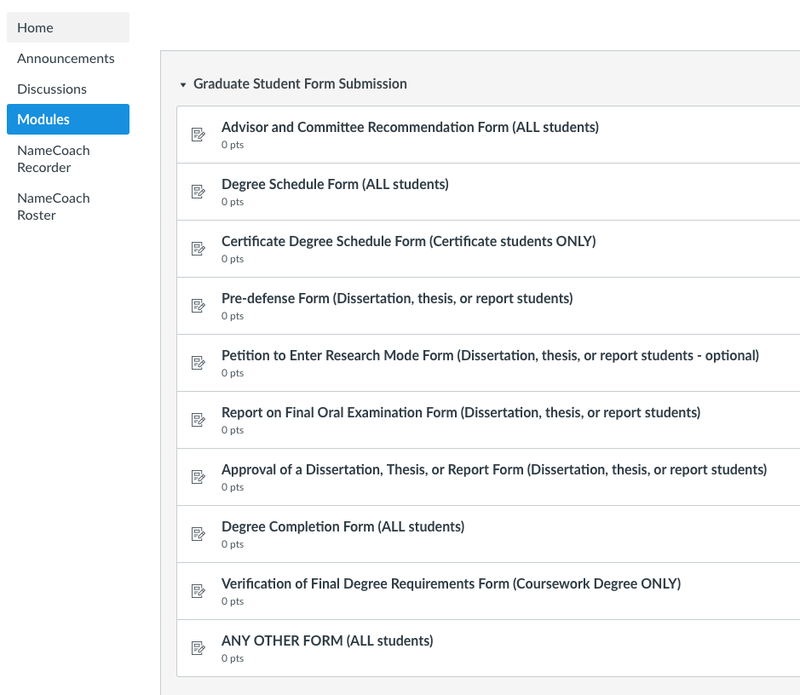 If you are already logged into Canvas, select the “Graduate Candidates” course and then “Modules” from the left hand menu. The modules page has sections for form, dissertation, thesis, and report submission. Under the section titled “Graduate Student Form Submission,” a list of the most popular forms is presented. Select the form you wish to submit. For any form that requires signatures, download the form, complete it, obtain the signatures, scan it, and then upload it to Canvas. If your form isn’t listed, submit it to the “ANY OTHER FORM” item. Please note that the Workspace Cleanout Form is only accepted via upload to MyMichiganTech. Look for the “Submit Assignment” button in the upper right of the screen and press it. Your submission will be date-time stamped and verified in the upper right of the screen. In the example shown below, the student submitted the file “verification.pdf” on June 18th at 5:02pm. 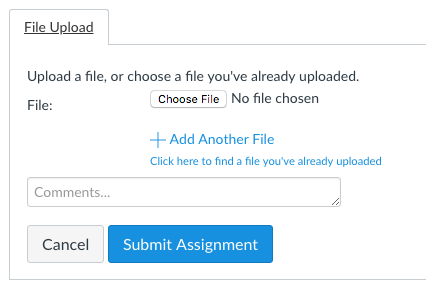 If you notice a mistake, or are asked to re-upload the form due to an error, please use the “Re-submit assignment” button to update your submission. Re-submitting the assignment will replace the current submission, so do not re-submit unless you are trying to update or fix your submission. Submission confirmation and re-submit option. Did you know that MyMichiganTech now allows you to update your expected Graduation Term with the Graduate School? It’s quick and easy to do, and by doing so your MyMichiganTech checklist will more accurately reflect what you need to do this semester. The first step to completing this task is to login to MyMichiganTech and navigate to the Current Students page. If you’re having trouble doing this, or you are new to MyMichiganTech, you may find our blog post on navigating MyMichiganTech helpful. This post can be found here. Funding may be available from the Graduate School to Department Chairs, School Deans, Graduate Program Directors, and Principal Investigators who must hire a temporary replacement for a student who has been granted an excused absence under the Parental Accommodation Policy. You can download the form from the Forms and Deadlines page. Now that you know where to find this form and how open it, let’s talk about filling it out. Is This The Right Form For Me? This form is for departmental use only. Students requesting Parental Accommodation should use the Parental Accommodation form found here. Departments using this form should be sure that the student has submitted the Parental Accommodation form to the Graduate School or this request will not be reviewed. The first few blocks are pretty self-explanatory; enter the last name, first name, and M Number of the student requesting leave in the appropriate boxes. Personal Information including Last Name, First Name, and M Number should be entered in the first section of the form. 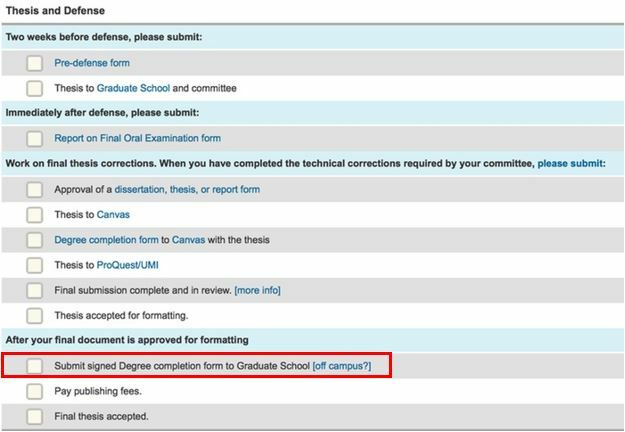 The Approval form indicates to the Graduate School that your technical corrections are complete, and your dissertation is ready for formatting review by the Graduate School. It also defines the access (open or campus) and embargo options for your dissertation. Your dissertation must be completely submitted by the deadline for the semester in order to complete your degree in that semester. The Approval of a Dissertation, Thesis, or Report form can be found on the Forms and Deadlines page or by clicking here here. Please note that this form, like many of our forms, is dynamic. As a dynamic form, it will only work in Adobe Acrobat or Reader. If the hyperlink above doesn’t open the PDF as expected, we recommend right clicking on the link, selecting “Save link as…” (or similar option in your browser) and saving the file. If you are still having trouble opening the form, check out this link which offers some more troubleshooting options. After you have saved the file, open Adobe Acrobat or Reader and open the saved form. Now that you know where to find this form and where we can open it, let’s talk about filling it out. The first section of the form consists of the Dissertation, Thesis and Report submission steps and instructions (click on the button that matches your document type to reveal the instructions). Please read the instructions carefully before filling out the form. Steps to follow and Instructions for submission of form. Students may appeal their dismissal as described in the Graduate Appeals of Suspension or Dismissal policy. In the event that the use of this form is necessary, please follow the instructions below to ensure an accurate submission of the form. The Graduate Appeal Form can be found on the Graduate Appeals of Suspension or Dismissal policy wbepage or by clicking here. Graduate students must submit a completed form to the Graduate School before the dean will consider an appeal request. This form must be submitted to the Graduate School within ten (10) business days of notification via email from the Graduate School of suspension or dismissal. The first section of this form asks for your personal information such as Last Name(surname), First Name(given name), M Number, and Date of submission. Date of form submission, Personal Information including Last Name, First Name, and M Number should be entered in the first section of the form. Submitting forms in a timely manner is essential for students to complete their degree requirements. Students can find a checklist of items needed at this time and a comprehensive list of items pending and complete for each degree on MyMichiganTech. See our tutorial for a walk-through. Today’s blog post provides instructions for filling out the Degree Completion Form. The Degree completion form is mandatory for all the graduate and doctoral program students and needs to be submitted to the Graduate School on paper or via email to gradschool@mtu.edu. Students can now see a personalized list of items they need to complete for each graduate degree on MyMichiganTech. If a degree requires a dissertation, thesis, or report, this form is mentioned under a separate section on MyMichiganTech detailing the items necessary to complete the defense and written document. The Degree Completion form can be found on the Forms and Deadlines or by clicking here. Degree completion form under section Items needed to complete a thesis and defense. Welcome back to the Graduate School blog. Our quest to reduce student errors on forms continues! This post is for students enrolled in a research degree: PhD, MS(Thesis and Report Options), and MFor. The Report on Final Oral Examination Form can be found on our Forms and Deadlines page under “Forms” and then “Current Students”, by following this link or on your MyMichiganTech page. Please note that the Report on Final Oral Examination Form, like all of our forms, is dynamic. As a dynamic form, it will only work in Adobe Acrobat or Reader. If the hyperlink above doesn’t open the PDF as expected, we recommend right clicking on the link, selecting “Save link as…” (or similar option in your browser) and saving the file. After you have saved the file, open Adobe Acrobat or Reader and open the saved form. To begin you will need to fill in your personal information. This includes your name and M Number. If you do not know your M number, you can always find it on MyMichiganTech. Providing your Last Name, First Name, and M Number allows us to keep accurate records of your progress towards your degree. Welcome back to the Graduate School blog. Our quest to reduce student errors on forms continues! This post is for all students looking to file a grievance with the Graduate School. The Graduate Grievance Form can be found on our Graduate Grievances page or by following this link. Please note that the Graduate Grievance Form, like all of our forms, is dynamic. As a dynamic form, it will only work in Adobe Acrobat or Reader. If the hyperlink above does not open the PDF as expected, we recommend right clicking on the link, selecting “Save link as…” (or similar option in your browser) and saving the file. After you have saved the file, open Adobe Acrobat or Reader and open the saved form. Qualifying exam is one of the prerequisites for a student to obtain PhD candidacy. A qualifying examination will be given to determine each student’s ability to apply general concepts and methods in their chosen field. For more information on the qualifying exam, please visit the Doctor of Philosophy requirements page. You can find the form for the report on qualifying exam on Doctor of Philosophy requirements page or by clicking here. Please note that this form is for use by programs for internal record-keeping and verification of exam results and should not be sent to the Graduate School. Qualifying examination and research proposal examination have a common form, so you may choose the type of result the form is filled out for. Typically research proposal examination is given after the qualifying examination. You will need to fill in your personal information which includes your name and M Number. If you do not know your M number, fret not, you can always find it on MyMichiganTech. 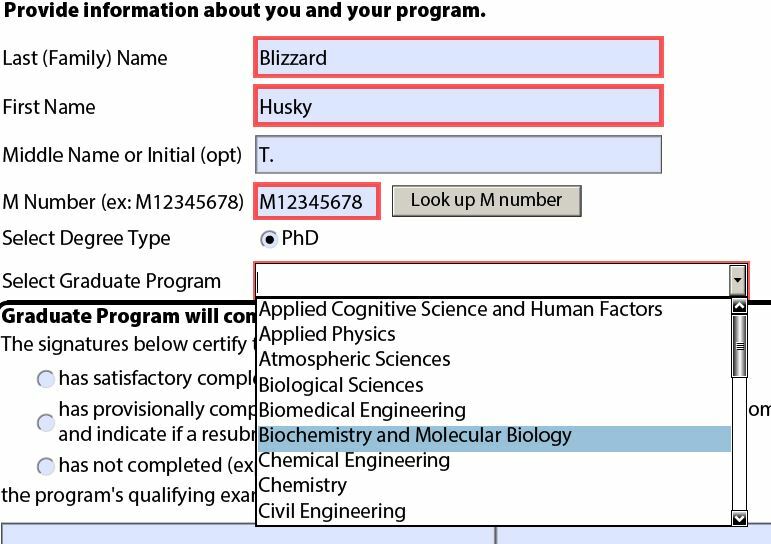 Also select with your graduate program from the drop down menu. The Readmission/Reinstatement form is required for students who have been inactive for academic, medical, or other reasons. You can find the Application for Readmission or Reinstatement form on Forms and Deadlines page or by clicking here. Fill in the form, save the form, and e-mail to gradschool@mtu.edu. Selecting the type of admission and providing reason for submitting the form.